According to World Health Organisation (WHO) estimates road death is the leading cause of death among children between 10 to 19 years of age. Warning against the expected deaths in the future, WHO notes that the problem is most severe in developing countries and that simple preventive measures could halve the number of deaths. Road traffic crashes are one of the world’s largest public health and injury prevention problems. Such alarming statistics call for interventions and a comprehensive outline of such measures is what is broadly identified under the umbrella of Road Safety & Traffic Management. This management, in turn, requires the development of scientifically-based techniques which will enable us to predict with confidence if safety resources are well-spent and if they are likely to be effective or not. Typically, the needs of motorists, as also the pedestrians and cyclists, revolve around having appropriate information to help them navigate safely and efficiently on roads. This translates into having the right set of traffic road signs, pavement marking and hazard marking. Retroreflectivity is the science behind all the road furniture. 3M, global leader in Road Safety, pioneered the retroreflective sheeting technology 60 years ago for road safety signs. This technology has seen major breakthroughs ever since. 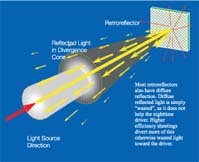 A retroreflector is a device or surface that reflects light back to its source with a minimum scattering of light. An electromagnetic wave front is reflected along a vector that is parallel to, but opposite in, the direction of the wave’s source. • With reflecting and refracting optical elements so arranged that the focal surface of the refractive element coincides with the reflective surface, typically a transparent sphere and a spherical mirror. • With a set of three mutually perpendicular mirrors that form a corner (a corner reflector or corner cube). Incident light on the retroreflective surface is retroreflected in a conic shape. A “perfect” retroreflector would send the light back to the headlight. That would be useless to the nighttime driver. Thus, some part of the light needs to be diverged from the incoming direction and returned somewhere around the headlight where the driver is likely to be. Different sheeting materials distribute the retroreflected light differently. In fact, some retroreflective materials scatter some of the incoming light in directions that are not useful to the driver, thus reducing the overall retroreflective efficiency. If a particular material redirects the otherwise scattered light to the driver’s eye, then that material serves the driver better. The “cone” of returned light is not uniform within the cone. More light is returned towards the headlight and less light is returned as one moves away from their headlights (upward), such as a heavy vehicle driver. Some basic metrics given below will clarify the performance of reflective sheeting better. The measure of the separation of a driver from his/her headlights is represented by the Observation Angle. Observation angle is the angle formed when light leaves its source, hits a sign face and returns to the observer’s eye position. The observation angle is fairly small in family sedans and sports cars; bigger in SUVs, pick-up trucks and minivans; and much large in large trucks where the driver’s eye position is often six feet above the headlamps. Observation angle also increases every second as a driver approaches a sign. As a general rule, large trucks have at least twice the observation angle as sedans at the same distance. SUVs and Light trucks also have larger observation angles when compared with sedans. Another critical condition in understanding the sign optics is the Entrance Angle, which by definition, is the angle formed between the perpendicular plane from the sign face and the angle at which light from headlamps enters the sign face. It is a measure of the skewness of the light entering the retroreflective surface. A zero degree entrance angle means that light is entering the sheeting surface perpendicularly. Entrance angle is a function of various parameters such as sign offset from the road, distance of vehicle to sign, travel lane of vehicle, road contour and twist of sign on post. The performance of retroreflective sheeting can be evaluated under two benchmarks: What percent of light is being retroreflected, and how is that retroreflected light percentage distributed within the cone of retroreflection.